Opening Reception at Sotheby's International in Asheville. When making the decision of where to live, like any life form, we look for a habitat in which to flourish. I am inspired by my surroundings in Western North Carolina, which is an ancient and preserved natural haven. I have further examined the luscious complexity of my surrounding ecosystems as if it were under a microscope, thus creating a series called Habitats & Interrelationships. Color is the key I use to unlock the doors of my compositions, as well as revealing abstract elements such as streams, caverns, pollination, plant life and the autumnal shift. I want the viewer to traverse these habitats, find appreciation, and reflect on how and what we can do to preserve and coexists together within our shared environment. This year I spent many weekends in Linville NC, where Grandfather Mountain rises 5,946 feet above sea level, and because of this considerable elevation gain, the mountain boasts sixteen ecological communities. In the spring, we were making the journey more than usual, which inspired the Pollination series. Every time we approach our destination, I can observe slight differences in the rock formations. Sights like Table Rock, Mount Mitchell, and later Grandfather Mountain, possess distinct characteristic that sets them apart in the landscape. 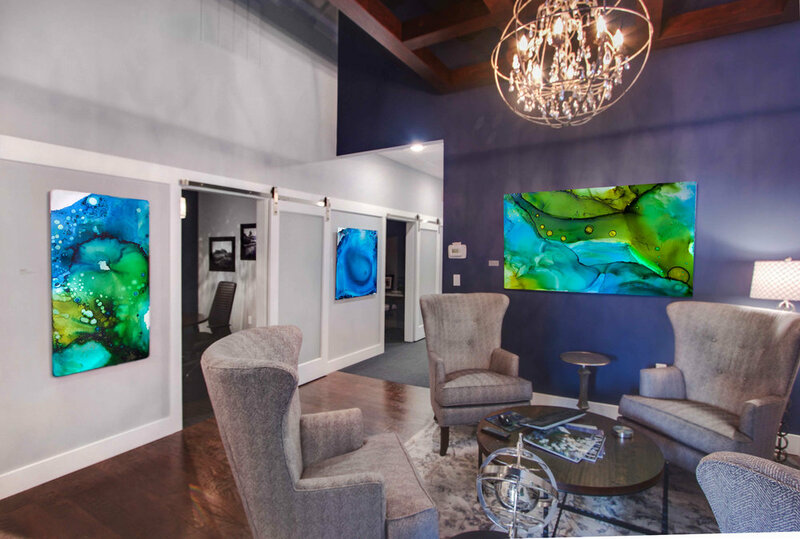 The Cavernous Series represents the splendor and wonders of the subterranean caverns of Linville Falls, and the dripping minerals that can be seen on the surface of exposed rock. Nestled in Linville Gorge is the Catawba-Wateree River basin. The water system stretches approximately 5,000 miles and provides drinking water and recreation to roughly two million people in 24 counties, 22 municipalities and two states. The river is also used for power production, industry, and agriculture. Hence this ecological community is portrayed in the Freshwater Series. As our visits continue, the drive north on the Blue Ridge Parkway has inspired the Autumnal Shift Series, which we all are currently witnessing. These environments have played a huge role in the development of our communities. Western North Carolina is known for its rugged character and is an incredibly rare botanical treasure, due to the conservation, pure beauty, and biodiversity. With the deepest affection, I proudly call this habitat my home.